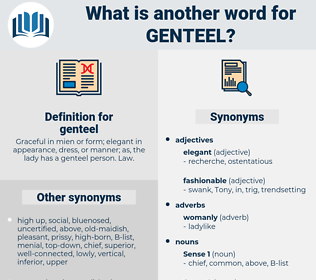 What is another word for genteel? Graceful in mien or form; elegant in appearance, dress, or manner; as, the lady has a genteel person. Law. unfashionable, uncultured, boorish, unrefined, rugged, rough, callous, uncivilized. backwoods, brusk, casual, degraded, insulting, presumptuous, rustic, raw, banned, ordinary, unrespectable, uneducated, awkward, illegitimate, unlettered, rude, gauche, ill-behaved, barred, blunt, unsatisfactory, Clodhopping, mean, lower class, seedy, unintelligent, junior, polyester, pretentious, conceited, forbidden, ungraceful, lippy, tacky, bluff, shabby, provincial, vulgar, plain, philistine, outlawed, knavish, intolerable, ignorant, untaught, proscribed, subordinate, arrogant, shameless, prohibited, Interdicted, grungy, unacceptable, untutored, unsophisticated, illiterate, heedless, indelicate. Even then he noted that the " gentleman inhabitants" whose " hospitality and genteel behaviour" he admired were discontented with the tone of the officials sent out from England. Native - born children especially prefer this work, as the more genteel and less laborious than work in the factories.